At this time of year, how often we think of holidays full of sunshine and leisure with beautiful bronzed people relaxing by or in the swimming pool or on a beach with a glass of wine or an exotic cocktail. The Côte d’Azur has long appealed to the luxury market. Provence rosé wine, though not usually in itself a luxury item, is used to evoke an image of luxury. ‘The World’s First Food & Wine Festival Dedicated to Rosé Wine’ – La Nuit en Rosé – takes place in New York, Los Angeles and Miami. wrote the Village Voice for the New York festival, which included a rosé tasting on a large yacht sailing round New York harbour. This is very much the classic image of rosé wine. 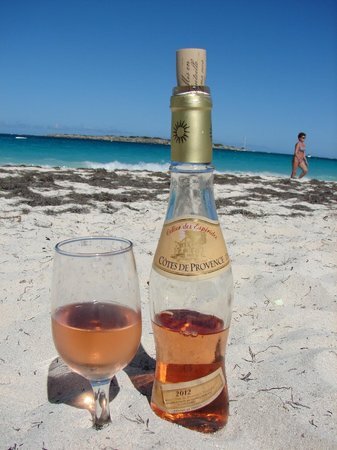 Provence rosés feature heavily in lifestyle photos and some wines even play on this image as part of their packaging. Not only do these wines shout “beach and pool”, but also look stylish on a restaurant table. Domaine Tropez’s ‘Sand Tropez’, made with 60% Cinsault , 35% Grenache, and 5% Syrah, promotes the beach-time image with its name written in sand on the bottle and the play on words of its name alluding to the glamour of drinking in St Tropez, perhaps on the beach or by the pool. With the increasing success of the market for Provence rosé and its wide distribution, the luxury holiday feel is within easy reach of many. 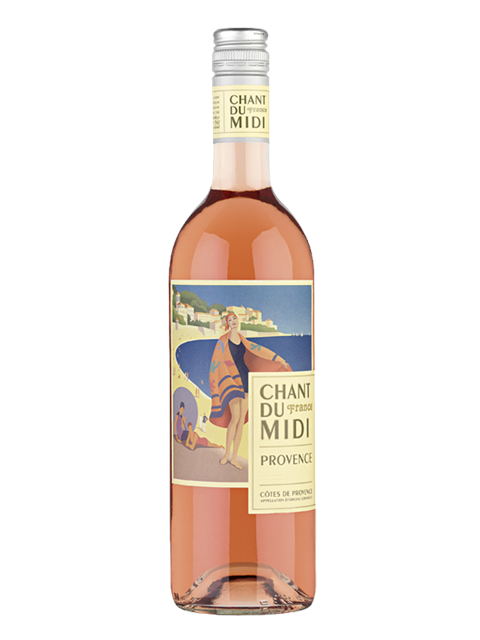 Evocative pictures of the South of France in the 1930s on the Chant du Midi rosé (left), with the classic colours of blue and pink continue the beach theme. 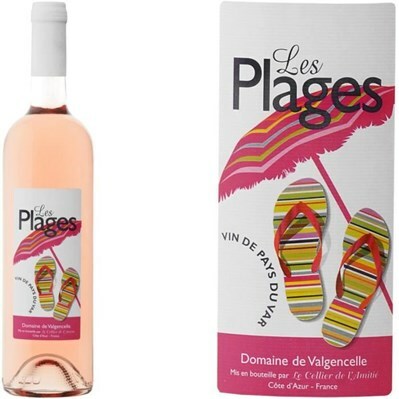 The simpler and fun ‘Les Plages’ (left), an IGP Pays de Var, with its label depicting colourful flip-flop sandals and a beach umbrella, is a wine for drinking very chilled on a hot summer holiday on the beach. 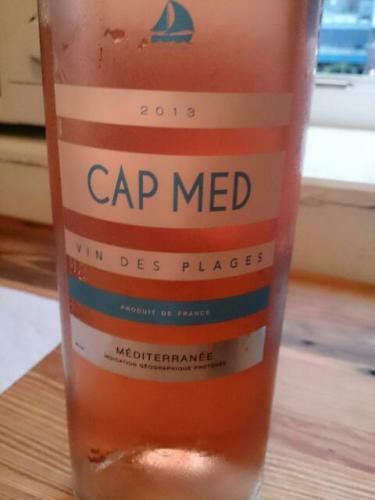 Cap Med Vin des Plages is a generic French rosé, again with a name aimed directly at beach-time drinking. With much of the rosé of Provence sold to tourists in the summer months, wines with instant holiday appeal in local supermarkets have a ready market. Buying for instant drinking at the beach means that many, if not most of these wines, have screw caps. In the hot summer keeping the wine cold is a challenge. Sometimes plastic ice cubes, ice buckets, easy access to the fridge are just not at hand. Dropping ice cubes into a glass of rosé became fashionable. In 2005 the co-operative Vinovalie in Gaillac, south west France, started thinking about the trend for putting ice in rosé wine. They saw two problems with this fashion. First, that as the ice melts the wine is diluted, making the drink weak and watery. Second, that to taste good when served so cold, the wine needs a different flavour profile. Vinovalie worked at creating a rosé specifically designed to have ice added. The end result, ‘Rosé Piscine’, has a slightly higher sugar level and uses a blend of grape varieties to give a stronger flavour suited being diluted. It has been a big success, selling 1.4 million bottles in 2014. On the back of this, a white and sparkling wine have been added to the Piscine range. Piscine’s success has sparked rivals. In 2007, South African brand Stormhoek’s winemaker Graham Knox created a rosé designed to have enough flavour to cope with melting ice called ‘Couture’. It is made with a blend of Pinotage, Shiraz and Cabernet Sauvignon. In 2014 another two rosés aimed at the iced rosé market were launched. GRM, a wine merchant based in south west France created their own IGP Pays d’Oc rosé for serving on ice called ‘Rosé on Ice’, made with 70% Grenache, 25% Cinsault and Syrah 5%, and drier than other rosés. JP Chenet launched their Grenache based ‘Ice Rosé’ wine. Moët & Chandon have also launched a white and rosé Ice Imperial Champagne specifically for serving with ice. The heatwave currently hitting much of Europe this summer is the perfect weather for these ice cold wines. Fruit-flavoured rosé wine-based drinks is a fast-growing category. They have a different marketing message, as they fall between the rosé wine sector and cocktails. 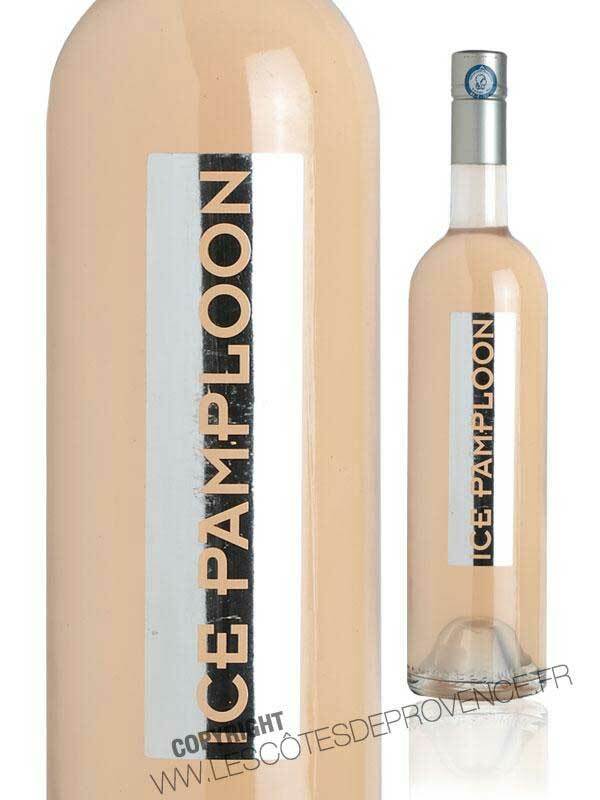 Chateau de Rouët‘s Cuvée Ice Pamploon is a rosé made with grapes grown within the Frèjus region, whose volcanic soil gives a crisp mineral character, flavoured with grapefruit juice. Domaine St Tropez have combined the ice and fruit characters to create another rosé style drink. 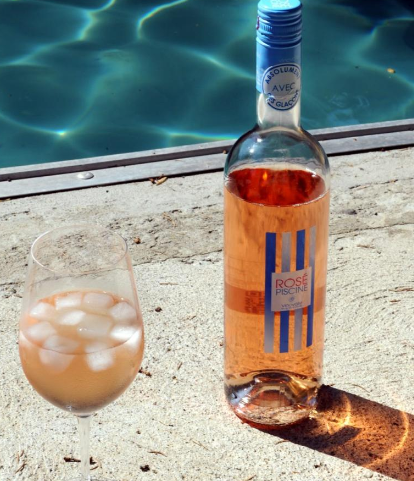 Ice Tropez, at 6.5% alcohol, is a rosé wine flavoured with peach, with its name hinting at connections with St Tropez, targeted at the beach and pool drinking market. It is supplied in small 27.5 cl bottles with crown cap and in cans. 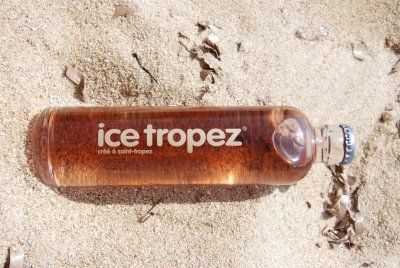 Ice Tropez 0% is an alcohol free, slightly effervescent, alternative, made with pink grape juice and white nectarine juice. These fruit flavoured wine-based drinks are currently at entry level prices, appealing to younger drinkers, but success is fuelling ambitions for making slightly more pricey fruit-flavoured wines. A major problem for drinking on a beach or in a pool is that there is nowhere to put a drink. Swimming around holding a drink above water is a feat worthy of an expert swimmer, but for most people, not easy. And after a glass or two, increasingly impossible. Floating tables do exist, good for swimming pools, but difficult at sea with waves. To solve this problem, the Beach Glass Company have designed their Beach Glass™ with pointed stem, which can float upright in water or be wedged in the sand (or snow or grass for picnics) to allow for drinking in the pool. The problem of refills still remains – although a bottle on a floating table is a possible solution. However, drinking on the beach and by the pool has a downside. The magazine Drinks Business recently reported on an alcohol awareness campaign which highlights the dangers of drinking and diving, after statistics showed that in 2014 more people drowned in Sweden than in any other year in the previous decade. The majority were men who had had a few drinks. 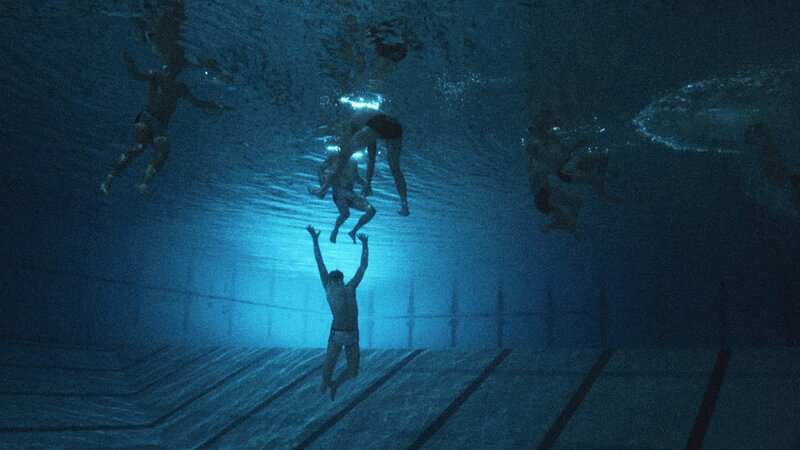 The “Don’t Drink And Dive” water safety campaign, launched by Swedish insurance firm Trygg-Hansa, shows a film of Stockholm’s male synchronised swimming team, before and after drinking alcohol, to demonstrate the effects on swimming after drinking. Apart from the humour of the swimmers in the film trying to synchronise (a dismal failure after drinking), it was shocking that these highly proficient swimmers needed rescuing by the lifeguards as they flounder, splash and sink. 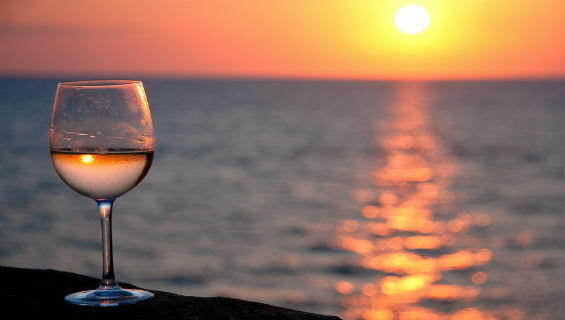 Drinking and swimming are a dangerous combination, so best to enjoy a glass of something AFTER swimming, when relaxing in the evening sun.